January brings top positions for Intact Media Group’s televisions. After a year in which the biggest media groups battled for the leadership position in TV channels charts, Intact Media Group leads the majority of time slots on the most relevant targets. Thus, the TV division is audience leader during Morning and Day Time. On the urban population and during Whole Day, Intact Media Group’s TV channels are leaders. At a national level, the TV divisioncome first on four time slots, amongst which Whole Day. More than ten million Romanians watched for at least one minute Intact’s productions, at a National level, during Whole Day, in January 2016. 2015 showed significant audience appreciation for Intact Media Group’s TV channels on all time slots, for the commercial target. 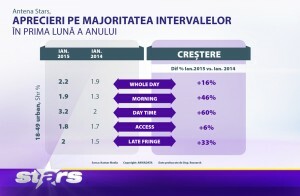 More than that, on all important targets ( commercial, All Urban and National), Antena 1, Antena 3 and Antena Stars are in top 10 TV stations, both during Whole Day and Prime Time, a unique performance for a media group in Romania. Another important performance for Intact’s TV division is that more than 11 million people watched its programs for at least one minute, on a national target in January. 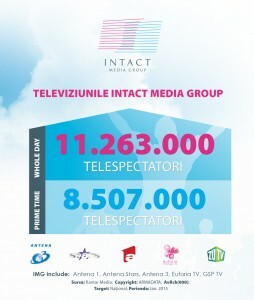 Intact Media Group’s TV channels’ audience figures increased on all time slots on the commercial target. The most consistent appreciation is during the Morning time slot (06.00-10.00) of 20%. Important appreciations are also on key time slots on the Urban and National targets. 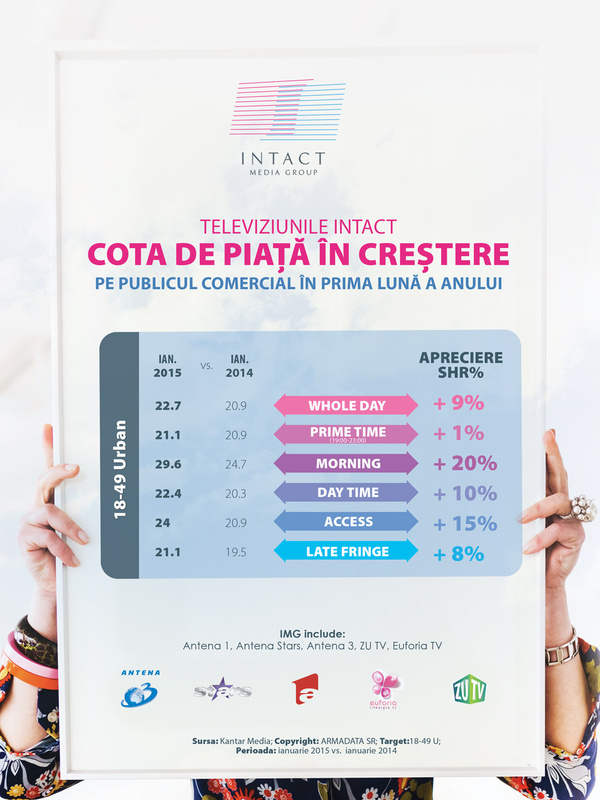 Intact Media Group’s TV channels are market leaders during Morning, Day Time and Access time slots. On the All Urban and National target, the leadership is extended during Whole Day as well. 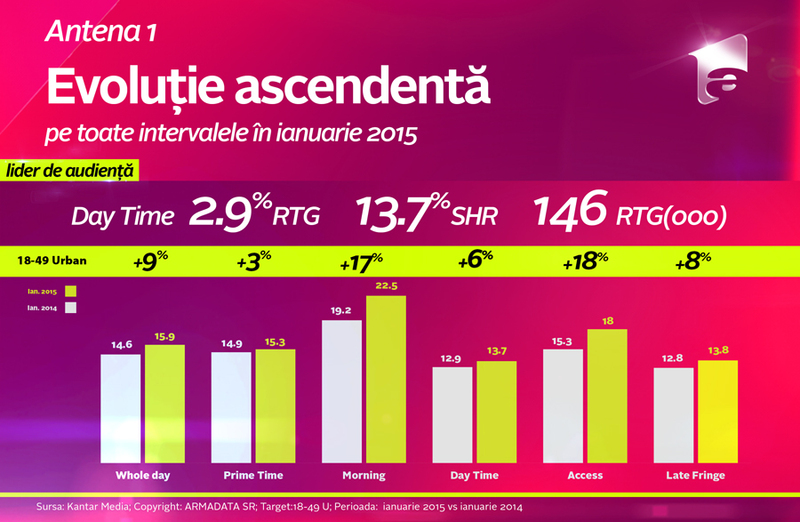 Antena 1 showed significant audience appreciation on all time slots on the commercial target. The biggest growth was during the Access slot, where the market share was up by 18% compared to the previous year. On the same target, the main competitor, Pro TV, decreased its numbers during Prime Time (19.00 – 23.00), Morning (06.00 – 10.00) and Late Fringe (23.00 – 02.00). 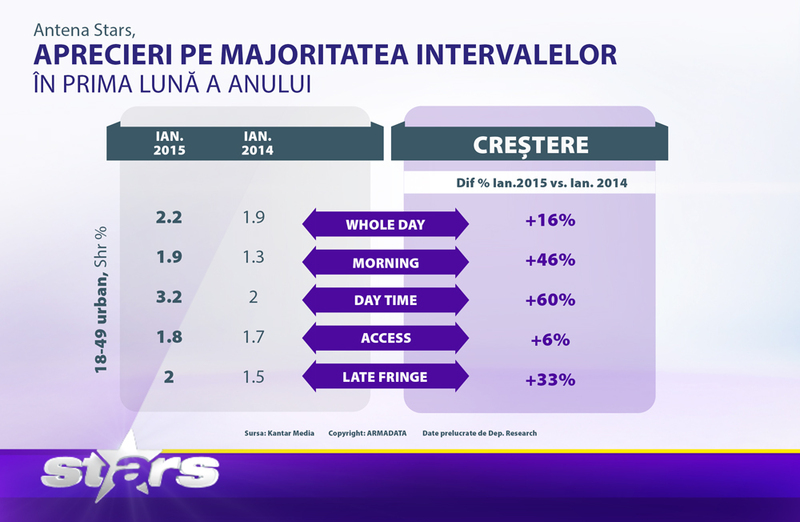 Antena 1’s market share showed appreciation on All Urban and National target, during Whole Day, Morning, Access and Late Fringe slots. Intact Media Group’s generalist channel is the absolute market leader during Day Time on the commercial public. 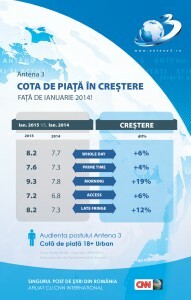 Antena 1 is also leads during Access on All Urban and National targets. Top 3 most watched shows in January include “Te pui cu blondele” (Beat the blondes) Observator 19 (the main news bulletin) and “Acces Direct” ( access show). Also, Antena 1’s daily strips, “Acces direct”, “Un show pacatos” (late night show), “Neatza cu Razvan si Dani” (morning show), “Mireasa pentru fiul meu” ( May I call you Mom?) and Observator (news bulletins) had a good start of the year. The show hosted by Simona Gherghe ( Acces Drect) holds leadership for 90% of the shows, on All Urban target. Dan Negru’s “Te pui cu blondele” (Beat the Blondes) had no rival on the All Urban and National targets, with 100% leadership, whilst Mireasa pentru fiul meu (May I call you Mom?) held the number one position on all important targets. 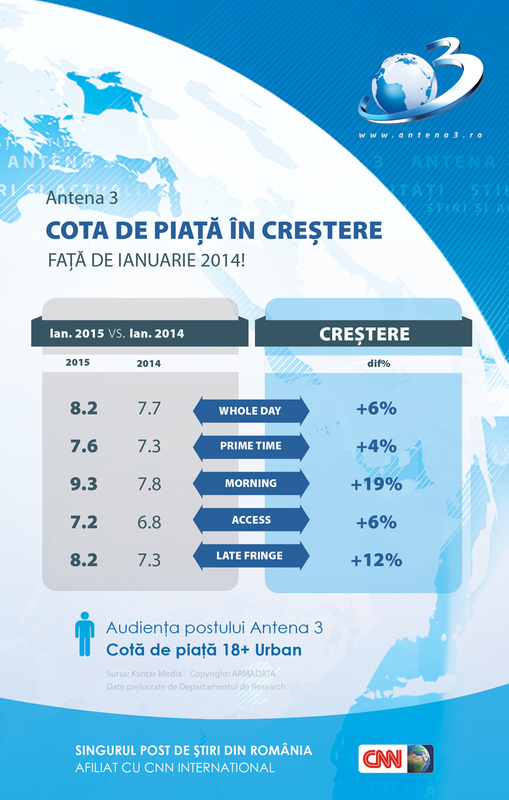 Antena Stars maintains its positive evolution, with significant growth on all time slots in 2015. 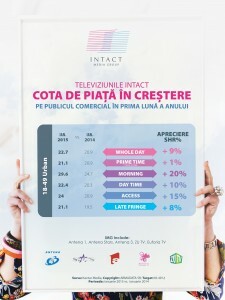 Rai da’ buni” (Mihai Morar), “Dosarele VIP” (Cristian Brancu and Dan Capatos), “Vedetop” (Raluca Bolos) and “Agentul VIP” (Cristian Brancu) are amongst the most watched shows on the commercial target. Antena Stars holds the 8th position in the all station’s chart, on the commercial target, both during Whole Day and Prime – Time. Intact’s news television channel maintains its leadership amongst its niche on all time slots, on the 18+ target. Antena 3 has significant audience appreciation on most time slots, with important progress during the Morning slot (+19%). “Sinteza zilei” (Mihai Gadea) was watched on average by half a million Romanians, “Punctul de întâlnire” (Radu Tudor), “Q & A” (Alessandra Stoicescu) ,“Subiectiv” (Razvan Dumitrescu) and “La ordinea zilei” (Dana Grecu, Radu Tudor) are amongst the most watched programs of the station. Intact Media Group’s channel for women indulged its viewers with some of the most appreciated TV Series worldwide. Euforia’s market share appreciated during Access time slot by 13% (Women, 18-49). “Downton Abbey”, “Dr. House –”, “White Collar” are just some of the most popular TV series that are part of Euforia’s grid. 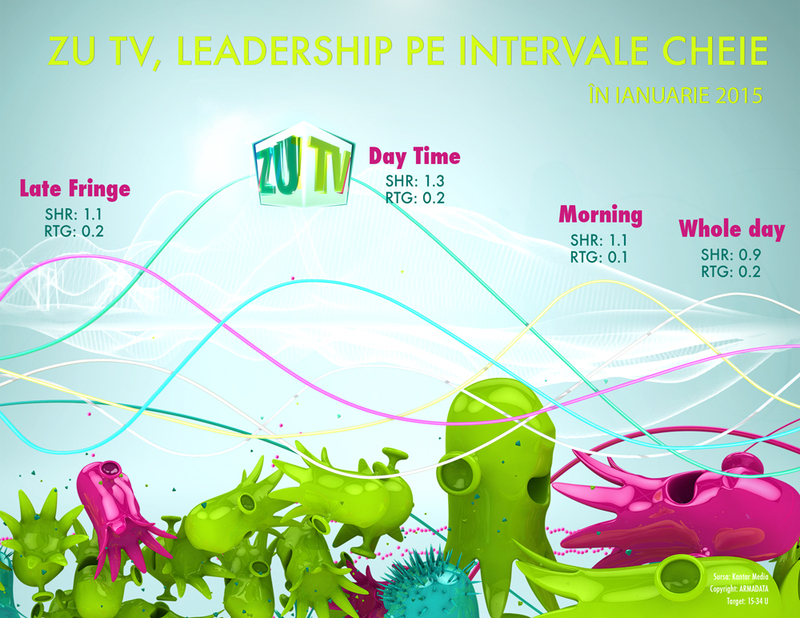 In January, less than a year after its launch, ZU TV is audience leader on its niche on four time slots, for the 15-34 target. ZU TV holds leadership during Whole Day, Day Time, Morning and Late Fringe. 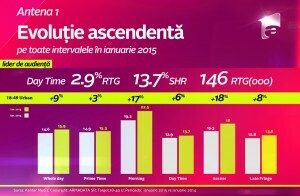 11.263.000 million Romanians watched for at least one minute Intact Media Group’s productions, at a national level, during Whole Day in January 2015. In Prime- Time, the number of TV viewers reached was 8 507.000. Intact thanks its public and its partners for all support and appreciates their contribution in achieving these results. World Television Day – the United Nations led initiative backed by the European Broadcasting Union (EBU), the Association of Commercial Television in Europe (ACT) and egta, the Brussels based association of television and radio sales houses.